(CNN) -- State officials said Monday that they suspect a drug reaction or toxins killed 21 horses as they were prepared to compete in a Sunday polo match in Wellington, Florida. 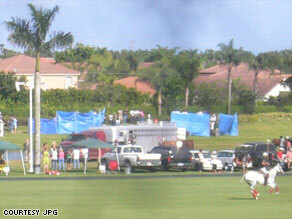 Blue tarps obstruct the view of horses that died at the International Polo Club Palm Beach in Florida. State officials and local law enforcement also announced Monday that they are launching investigations into the deaths as scientists work to pinpoint what exactly killed the horses. Officials believe that the "very rapid onset of sickness and death" points to toxins or a drug reaction and also allows them to rule out other possibilities. "At this time, there is no evidence that these horses were affected with an infectious or contagious disease, as there are no other horses affected at this time," according to Florida Agriculture and Consumer Services spokesman Terence McElroy. Officials are continuing to conduct tests, and Florida agriculture scientists are performing necropsies on the animals. "We'll be testing blood and tissue to see what the common denominator was here: Was it something injected? Was it bad water? And so forth," McElroy said. "This was a mistake of a combination of something, and whether the mistake was at the barn, whether the mistake was at the feed company, whether the mistake was at the vitamin company," Scott Swerdlin of the Palm Beach Equine Clinic, who treated some of the horses, told CNN affiliate WPTV. "We don't know, but we're going to find out." James Belden, a veterinarian at the Left Bank Equine Clinic who also treated some of the horses, told WPTV that he and others don't suspect foul play. "I think this is an accident," he told WPTV. "A terrible accident." McElroy said that despite the early indications, he does not want to jump to conclusions about what happened. "Obviously, this is a tragic situation, and we are working hard to determine what happened," he said. "But it would be irresponsible to speculate on what may have killed the horses. We will wait until the facts are in before making any specific comments on the case." Officials in the state Agriculture and Consumer Services Department will investigate the case with the help of the department's Division of Animal Industry, the department's Office of Agricultural Law Enforcement and other law enforcement agencies. The horses were part of the Venezuela-based Lechuza Caracas team and were being kept at the team's trailers on the grounds of the International Polo Club Palm Beach. Fifteen horses that seemed disoriented died before Sunday's match, said McElroy, and their bodies were sent to the state-run Kissimmee Diagnostic Laboratories near Orlando, Florida. Luis Escobar, a player on the opposing Team Blackwatch, was on the grounds when the horses began to fall ill.
"I thought it was something temporary, and I saw a veterinarian and thought maybe it was one or two horses, and the vet was going to give something to help them out, and it was going to be done," he said. "But it wasn't." Escobar said soon things got worse, and other horses started to get sick. Peter Rizzo, executive director of the United States Polo Association, was at the match and saw the horses drop. "It was surreal," he said, calling the deaths "unprecedented." "It is a horrible tragedy," he said. Some of the 15 horses died immediately, but some lingered for about 45 minutes, Swerdlin said Sunday, according to a report in the Sun-Sentinel newspaper. The clinic is the International Polo Club's consulting veterinarian group, the newspaper said. Six of the 21 horses were kept overnight in the same trailer in Wellington, said McElroy, and died sometime between Sunday and Monday. Their bodies have not been taken to the Kissimmee lab. Escobar said he's never seen anything like the scenario that unfolded Sunday night. He says the players and trainers do "everything possible" to keep the horses in optimum condition, saying "they are babied every single day, all day long." The U.S. Polo Association, the sport's governing body, is opening their own investigation. Celeste Kunz, chief examining veterinarian at the New York Racing Association and a 19-year veterinarian, said Monday that she suspected a tainted substance was injected into the horses. "[It was] something that was administered for it to work in a short amount of time and have an animal succumb that quickly," Kunz said. "My thought is that something was injected, because it would have to affect the central nervous system." Escobar, from his experience with the animals, agreed. "When something like this happens, if there was disease or illness or virus, other horses would already be coming out," he said. "Anything that would come whether it's something like this or a small stomachache, we see it, because we are there with them all the time." Anabolic steroids are not likely to have caused the deaths, either, Kunz said. "It takes at least five days for [anabolic steroids] to really work, and the effects aren't real obvious at first," she said. "Most of the time, [anabolic steroids] are used to build up their muscularity." Each team brings between 40 to 60 horses for matches. The ponies are continuously switched out throughout a match to keep them from overexerting themselves, O'Connor said. The horses were between 10 and 11 years old and were valued at about $100,000 each, club spokesman O'Connor said, according to the Sun-Sentinel. CNN's Kimberly Segal and John Zarrella contributed to this report.